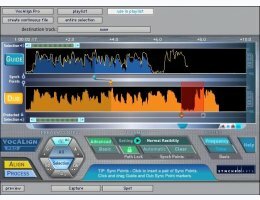 VocALign Pro 4 is the most advanced version of the legendary VocALign program, providing instant tight alignment of one audio signal to another. Simply capture a Guide signal with the right timing, capture a Dub signal to be aligned, press one button, and a new aligned Dub is generated and returned to your DAW. An iLok account is required to authorize Synchro Arts products. With the iLok License Manager, you can deposit your license either on a 'computer' or on the 'iLok Dongle. (iLok keys can be purchased from www.ilok.com or at your local dealer). Mac OS X 10.6.8 or higher with Intel processors (32-bit) and (64-bit). Windows Vista (service pack 2) and Windows 7, 8 (32-bit) and (64-bit).